Noodles Chôp is pretty near Hangar J1. Immerse yourself in stunning Mediterranean cuisine here. Most visitors suppose that you can order nicely cooked noodles, pad thai and prawns here. Take a break and eat tasty parfait. This restaurant will offer you delicious port wine. It is cool to enjoy great thai tea. If you look through the guests' comments, the staff is attentive at Noodles Chôp. Fabulous service is something guests appreciate here. A lot of people mark that the dishes have low prices. There is a cool ambiance and spectacular decor at this place. The overall score is 5 on TripAdvisor. 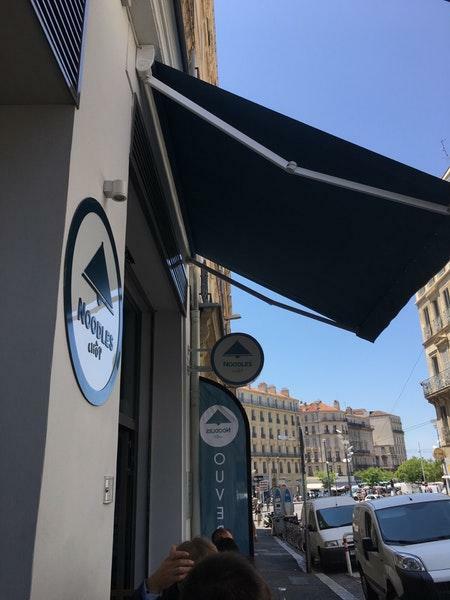 We found this noodle bar on a day trip to Marseille. Very happy that we did!! The staff were amazing, even though our French is appalling! The food was even better. So fresh and full of great flavours. When we are back in the area, this will be on our list of places to stop at. Keep up the great work Noodles Chop! Great food, cheap price and extremely friendly employees. It’s ok (took the pad thai), but nothing special or great; was hoping for something more authentic.But the staff is great and very friendly!